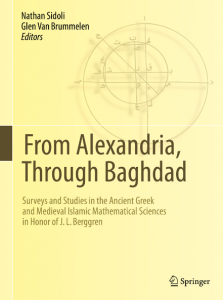 Of interest to scholars and students of the history of mathematics and astronomy in ancient Greece and Medieval Islam is this volume, honouring the career of history of mathematics professor J.L. Berggren. The volume includes contributions spanning approximately seventy years of research, from the mid twentieth century onward. For more information, please see the Springer web site.